For the ever-dwindling minority of Christians who remain in the Palestinian territories, many are recluses -- bound by political and social pressures that have jeopardized their right to live out fundamental aspects of their faith, and have resulted in severe violations of their basic human rights. 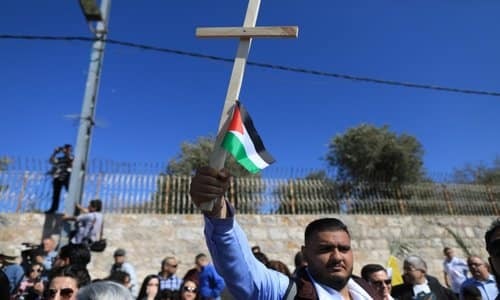 A report published in January by the faith-based watchdog group OpenDoors USA, ranked the Palestinian territories #49 within its annual assessment of regions of the world with high levels of Christian persecution. The data reveals that of its five million inhabitants, only 46,600 Christian Arabs remain in the West Bank and Gaza combined. In August 2016, I had the opportunity to visit one of the few evangelical Christian outposts in the Palestinian territories -- a congregation of just 300 Palestinian Christians in Bethlehem. Our American Christian delegation gathered in the church hall as senior pastor Steven Khoury explained that their ministry has persisted for over three decades despite continual threats to his own life and to the members of his congregation. Since its founding in 1980, First Baptist Church of Bethlehem has been the site of nearly 15 bombings, countless death threats, and a tragic casualty -- Khoury's own brother, who was stabbed while entering a vehicle outside his home. The issue of religious tolerance and human rights remains a widespread problem in the Middle East, one brought to light by several NGOs and watchdog groups since the early 2000s. In recent years, mainstream media outlets like CNN, Reuters, and the BBC have begun regularly reporting on attacks on Coptic Christians in Egypt, religiously-motivated genocide in Yemen, and suicide bombings aimed at Christian villages in Lebanon. We should be grateful for any reporting that stirs global awareness and encourages advocacy for Christian minorities. Organizations like OpenDoors USA, In Defense of Christians, the Iraqi Christian Relief Fund, Voice of the Martyrs, and USAID -- coupled with overwhelming support among the general public -- have made incredible strides in helping Christians in the Middle East. Many of these groups that advocate on behalf of Middle East Christians understand and emphasize the power of financial resources for these persecuted people. The goal in the majority of cases is survival -- funding to cover basic needs like food, housing, and legal expenses. But Palestinian Christians not only face comparable domestic circumstances to Christians across the Middle East. There is also another, less reported threat to their existence: the BDS movement. The Boycott, Divestment, and Sanctions (BDS) movement is a self-proclaimed effort to undermine Israel's economic activity in the West Bank, and to disrupt countries' commercial and diplomatic ties with Israel across the world. And the true goal of BDS is to destroy Israel as a Jewish state. But Palestinian Christians also bear the brunt of an effective boycott. This is a detail that leaders of the movement fail to mention when touting their apparent success at reducing exports from Israel, and discouraging foreign investment in Israel. In actuality, closed factories, fewer job opportunities, and restrictions on developing infrastructure do one thing very well: hurt Palestinians, especially those facing political and social pressures to abandon their faith, like Palestinian Christians. As Christians, the image of the Body of Christ should encourage us to think critically about how we respond to issues that affect our brothers and sisters around the world. One does not need to always support the State of Israel to believe that there must be a better way to express our political opinions than to jeopardize the livelihood, financial stability, and resilience of Palestinian Christians. Yet in spite of this, Christian denominations like the United Church of Christ, Presbyterian Church (USA), and the United Methodist Church have all voted in favor of the disastrous and ineffectual BDS movement. It should bring us to grieve further when study abroad programs, fellowships, and culturally immersive experiences are also affected by the boycott -- and when the BDS movement stands in the way of student exposure to the complex cultural and geopolitical realities of the Israeli-Palestinian relationship. How else will students be moved to stand in defense of Palestinian Christians and efforts to make a positive impact on their lives? How else will students stand up to the human rights abuses and corruption in the Palestinian government? If the threats and continued struggles of Palestinian Christians are to be taken seriously, we must be able to see past the shallow and unproductive cause that is BDS, and respond to the problems facing the region with love and genuine concern -- not hatred and bigotry.